In Top 5 Crazy Looking Range Hoods we explored range hoods that don’t really look like range hoods. These designer vent hoods look more like sculptures or lighting fixtures than kitchen fans. A new trend in interior design is to make the range hood as beautiful as the rest of the home, and these range hoods definitely accomplish that. In this blog, we’ll go over five more range hoods that surpass expectations for kitchen aesthetics. It’s obvious the range hood isn’t just for kitchen ventilation and lighting anymore. It can become a focal point of the kitchen and showcase the homeowner’s personality and style. First on the list is Sun, a wall mount range hood from Best. This range hood may not look like one, but it definitely is. It’s complete with 460 CFM, dishwasher-friendly grease filters and options for ducted or ductless use. This Italian design comes in black or white and the chimney is optional. This range hood will definitely make a statement in the kitchen. Second is another Elica hood; the 70cc Evoque from Elica looks more like a bread box than a range hood, but it’s surprisingly beautiful. This range hood captures grease from three sides and comes with Perimeter Ventilation Technology, which includes increased efficiency in ventilation power. This range hood has 380 CFM and a stainless steel circular touch control. It is named the 70cc because it is constructed with two “C” shaped pieces, including one made of glass and one made of steel. Third on the list is another Best range hood known as the Lipstick. We can’t decide if this looks like it should be in a 1950’s diner or a science-fiction spaceship. The Lipstick has 400 CFM, four speeds, delay power shut off, cleaning reminder, Heat Sentry and a whole lot of color. The red and brushed stainless steel will definitely pop on the wall. This hood can also be operated as a ducted or ductless range hood. Wait, is that a lamp, or a range hood? The fourth vent hood on this list is the Grace by Elica. This 20” wide range hood has 300 CFM, your choice of white or black glass and a Magic Wand control. Elica has an extension kit available for this hood and a wall mounting bracket. The more we think about it, the more we think it looks like a hair dryer. However, within the context of a modern kitchen, this range hood looks very elegant. The last range hood on this week’s list is the DA 289 Designer Wall Hood from Miele. It looks almost like a normal wall mount range hood with a tempered glass canopy, but it puts a spin on the traditional look we know. Like some of the other hoods, this one has the option to be used ducted or ductless, grease filters, a delayed power off feature and a cleaning reminder. This hood also has 625 CFM and the stainless steel design is 36” wide. There you have it: five unique range hoods to pique your interest and inspire your home decorating creativity. This entry was posted in Range Hoods and tagged Best Range Hoods, CFM, design, Elica, extractor hood, interior design, kitchen, miele, range hood, range hoods, stainless steel on July 30, 2014 by editor. This infographic from Range Hoods Inc explores the difference between a gas range and an electric one. Which one will you use in your kitchen? This entry was posted in Range Hoods and tagged appliances, cooking, electric range, gas range, home improvement, kitchen, oven, range, range hood, remodel on July 28, 2014 by editor. Crank it to 11 with a kitchen range hood from Range Hoods Inc. This entry was posted in Range Hoods, Wall Mount Range Hoods and tagged funny, humor, range hood, range hoods, Spinal Tap, wall mount range hood on July 25, 2014 by editor. Imagine being able to change your home’s thermostat without leaving the kitchen. It’s possible with the Nest Learning Thermostat, a smart thermostat that saves energy. In fact, it may be possible to control your washing machine, lightbulbs and garage door from a Nest device. Last time, we discussed Kitchen Tech Wednesday: Alima Smart Indoor Air Quality Monitor. Today, we’ll look at a gadget that controls the temperature of the air in your home. Appliances are becoming smarter and smarter as people have begun to expect more from their technology. 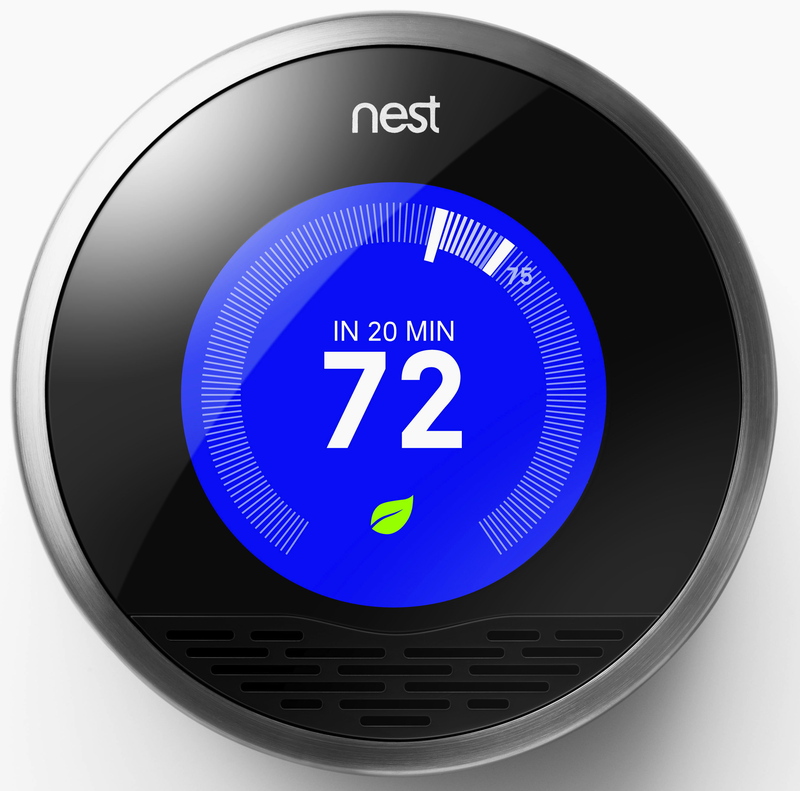 The Nest Learning Thermostat can be controlled from the smart phone app. This little $250 device is estimated to save families as much as 20% on their energy bills. It is easy to install and can be added to your home in as little as thirty minutes. The Nest Learning Thermostat creates customized programming for your home heating and cooling by learning your preferences and schedule. It also includes an Auto-Away feature to save energy when no one is home. You can change the temperature remotely via the app on days when your schedule changes unexpectedly and you’ll be home at a different time. To connect the Nest to your home heating and cooling systems, the device has to be authorized one time via the app. If you need more than one Nest in your home, you can control both thermostats from the app. You’ll no longer have to walk across the house to change both your thermostats. Nest will create programming that remembers your family’s preferences during different times of the day, night, weekends and while you’re away on vacation. Nest is more effective at saving energy than simpler programming systems. The company claims Nest pays for itself with the savings you’ll earn when your energy bill goes down. Other companies/products involved in the program include Mercedes-Benz, Chamberlain’s MyQ Smart Garage Door Opener, Logitech’s Harmony Universal Remote, Google and Jawbone UP24 Wristband. With the Developer Program, your Mercedes-Benz car can alert Nest when you’re arriving home so it can turn on the heating or cooling for you. You will also be able to control LIFX lightbulbs with Nest, so you can turn lights on or off and make it look like you’re still home. It can also make the lightbulbs pulse red for emergencies. Nest also offers a smoke and CO detector. Nest’s goal is to make home products simple and helpful. With the evolution of the smart home, it looks like soon we’ll be able to control every aspect of our homes from our phones and tablets! If you would like to compare more smart thermostats for your home, check out this smart thermostat comparison. This entry was posted in Kitchen Tech and tagged Carbon monoxide detector, gadget, Google, home automation, kitchen, LIFX, Mercedes-Benz, Nest Labs, smart home, Thermostat on July 22, 2014 by editor. Shop for range hoods on RangeHoodsInc.com. This entry was posted in Range Hoods and tagged funny, humor, Power Rangers, range hood, range hoods, range hoods inc on July 18, 2014 by editor. Looking for an interior designer? Believe it or not, the best place to look may be on social media. We’ve created a list of interior designers who are active on social and produce beautiful work. Don’t worry, we couldn’t pick just five; we’ll be continuing this post in an upcoming blog series. While you’re thinking about kitchen design, don’t forget to check out Feng Shui in the Kitchen. The English Room (@theenglishr) – This design firm is quite active in social media. Holly Holingsworth Phillips is the co-owner of The English Room and is known for her signature style and use of color. She works on the East Coast and has a degree in Interior Design from the American College. Greens, oranges and blues can be seen throughout her work. All of these colors come together in her signature style and becomes something playful, yet elegant. Martha O’Hara Interiors (@OHaraInteriors) – Martha O’Hara Interiors is made up of 16 designers, two design associates and a support staff. This large interior design firm is located in Minneapolis, Minnesota. The firm offers a wide range of services, including build and remodel, interior design, furniture sales and work for out of state clients. The staff runs fun interior design polls on its Twitter account, which encourages community engagement. 2LG (@2lovelygays) – This interior design duois known as 2 Lovely Gays and is made up of Jordan Cluroe and Russell Whitehead. They were at the top of the final #Decorex100 list of 2014 and were nominated by other Twitter users. They believe in, “Making living lovely, one room at a time,” and believe each room should have a voice that speaks about the homeowner. Fun fact: they own St. David Coffee House in London. Insideology (@insideology) – Annie is from North London and runs the blog Insideology. Her most recent blog posts are a part of Blog Tour NYC (presented by Modenus). Annie is an interior designer that blogs regularly about all topics, including health, traveling, topics like how to dim a table lamp and activities in London. Her blog has a fresh style; keep an eye on this one. LisaMendeDesign (@LisaMendeDesign) – Lisa Mende is the principal of Lisa Mende Design and a member of ASID. She mixes traditional design with a modern feel. Lisa works with Traci Zeller in Charlotte, North Carolina. Lisa is an ambassador for the La Cienega Legends Design Quarters and has been a panel member of the High Point Market Style Spotter Program. She keeps her blog up-to-date with topics like Pearls of Wisdom, trends at Paris Fashion Week and anniversary ideas. These designers exemplify style, professionalism, taste and success in social media. Check back for a blog series on top interior designers to follow. You can follow the five listed here; their Twitter usernames are placed next to their names. This entry was posted in Kitchen Design and tagged interior design, London, Minneapolis, Modenus, Paris Fashion Week, Twitter on July 15, 2014 by editor. More Power?…We might have that! This entry was posted in Range Hoods and tagged funny, home improvement, humor, range hoods, range hoods inc, tim allen on July 11, 2014 by editor. In honor of National Chocolate Day, which fell on Monday, July 7 this year, we are dedicating this week’s recipe blog to chocolate creations. If you feel like some delicious summer recipes, check out our last blog about food: Fourth of July Recipes. Chocolate goes all the way back to the times of the Aztecs and the Mayans, who popularized a chocolate drink. Chocolate is created from the seeds of the cacao tree. The seeds are fermented, dried and roasted before being ground into what we know as chocolate. What is it about chocolate that drives us so crazy? Chocolate releases a neurotransmitter, dopamine, which makes us feel good. The feelings chocolate makes us experience are partially traced to the food’s mouth-feel. Chocolate also contains chemicals, like caffeine and theobromine, which make people feel pleasure and more energized. Lastly, in general, chocolate is associated culturally with rewards and with romantic love. This ice cream recipe from One Chopping Board by Joel includes sweetened condensed milk, dark chocolate buttons, whipping cream, sweetened cocoa powder and vanilla extract. The ingredients are mixed and frozen over night. You can add any mix-ins you want or eat it as is. Throw it in an ice cream cone or eat it with fruit if you desire. Culinary school graduate Tessa invented this brownie recipe to satisfy all of those cravings and the longing we feeling for the perfect brownie. These are chewy in the middle and have a crunchy top. She used semisweet chocolate chips, unsalted butter, granulated sugar, unsweetened chocolate, eggs, sea salt, vanilla extract and flour. She also recommends using a cake tester to tell when these amazing brownies are done cooking. Tessa really sounds like she knows what she’s talking about. Laura, author of Tutti Dolci, shared this recipe for cookies that don’t require multiple trips to the oven. She likes to bake with local ingredients and has been blogging since 2010. She used a tart shell and mixed semisweet chocolate, dark chocolate and white chocolate. You can customize the chocolate in this recipe to your preference. This recipe includes a lot of ingredients, so be sure to read it thoroughly, and don’t forget to save some chocolate chips to put on top of your giant cookie cake. Ali of Gimme Some Oven came up with the idea to mix Nutella into her hot chocolate. Who doesn’t love Nutella, right? Hazelnut chocolate-y goodness is what it’s all about. She mixed Nutella and milk to create her hot chocolate and suggests adding your favorite hot chocolate toppings. Ali shares quick, easy and delicious recipes on her blog. We hope these recipes bring you some comfort and that you have fun experimenting with chocolate. This entry was posted in Food, Recipes and tagged brownies, cake, chocoalte, cookie, cooking, food, nutella, recipe on July 10, 2014 by editor.